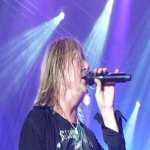 Def Leppard singer Joe Elliott was interviewed in in late July by Ron Keel for Radioscreamer and talked about the second Las Vegas residency. Joe recently said it was highly likely they would return in November 2015 when speaking to 98.7 Gater FM radio. "Absolutely, that was such a fantastic thing to do 23 nights in the same bed. The crowd went on tour, we didn't move. It was like this is amazing you know. It's some job, we opened for ourselves as Ded Flatbird playing as obscure stuff as we could, a few hits, Let's Get Rocked and stuff like that. But we were digging out old B Sides that were 33 years old and playing this kind of bizarre eclectic opening set for ourselves and then having to get off, get changed and come back on as the million dollar Def Leppard for the Hysteria thing. Two hours and 25 minutes worth of that for 11 shows, it was pretty intense, But it was such a vibe and they loved us, we loved doing it they want us back." "We haven't a specific date set but we'd love to do, whether we call it VIVA! Pyromania which I don't know but - you know I think the logical thing to do next would be Pyromania." "We are looking forward to going back there. It was a good relationship with the Hard Rock. the people that run it like what we did, we liked being there. So it kind of makes no sense not to do it again."